The announcement was made by United States Attorney Brian J. Stretch, Federal Bureau of Investigation (FBI) Special Agent in Charge John F. Bennett, and Food and Drug Administration (FDA) Office of Criminal Investigations’ Los Angeles Field Office Special Agent in Charge Lisa L. Malinowski. The sentences were handed down yesterday by the Honorable Lucy H. Koh, U.S. District Court Judge, bringing an end to all but one of the cases brought against 11 defendants charged in a scheme involving the manufacture and sale of millions of bottles of the liquid dietary supplement 5-Hour ENERGY. On November 28, 2016, a jury in San Jose found Joseph Shayota, 64, and his wife, Adriana Shayota, 45, (the Shayotas) guilty of conspiracy to traffic in counterfeit goods, as well as conspiracy to commit criminal copyright infringement and to introduce misbranded food into interstate commerce. The criminal conduct began in late 2009 and ran through October 2012. Over 3,700,000 bottles of counterfeit 5-Hour ENERGY were placed in the stream of interstate commerce. Besides the Shayotas, other defendants charged with various roles in the scheme include: Justin Shayota, 33, of Spring Valley, Calif.; Walid Jamil, 57, of Troy, Mich.; Raid Jamil, 48, of West Bloomfield, Mich.; Kevin Attiq, 52, of El Cajon, Calif.; Fadi Attiq, 59, of El Cajon, Calif.; Leslie Roman, 63, Rancho Cucamonga, Calif.; Mario Ramirez, 56, of San Diego; Camilo Ramirez, 32, of San Diego; and Juan Romero, 70, of Mexico City, Mexico. At trial, the evidence demonstrated that the Shayotas, through their company Tradeway International Inc., (doing business as Baja Exporting, LLC), entered into an agreement with Living Essentials, LLC, to distribute 5-Hour ENERGY in Mexico. Living Essentials owns 5-Hour ENERGY and registered and owns all 5-Hour ENERGY trademarks and related copyrights. 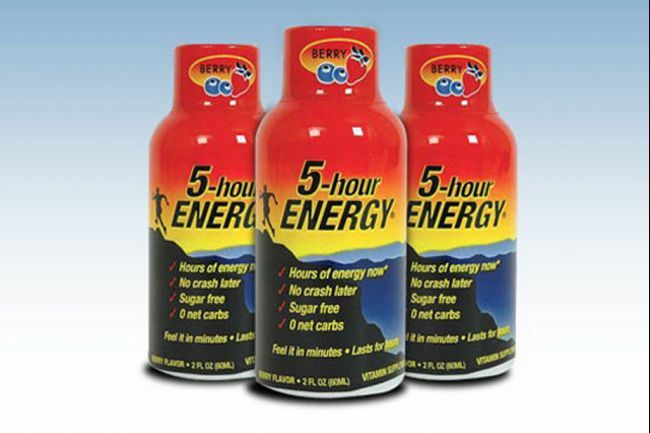 The company does not grant licenses to any individual or entity to manufacture 5-Hour ENERGY. As part of the distribution agreement, Living Essentials manufactured and provided the Spanish-labeled 5-Hour ENERGY bottles to the Shayotas, who were unable to sell it in Mexico. The Shayotas and their co-conspirators then removed the Spanish-language labels and replaced them with counterfeit English-language labels. They also removed the true lot numbers and expiration dates placed on the bottles by Living Essentials and replaced them with false lot numbers and expiration dates. The Shayotas and their co-conspirators sold this counterfeit-labelled product throughout the U.S. The evidence at trial demonstrated that by early 2012, the Shayotas and their co-conspirators began to manufacture and sell an entirely counterfeit 5-Hour ENERGY product. They manufactured the counterfeit 5-Hour ENERGY liquid at an unsanitary facility using untrained day workers, and mixed unregulated ingredients in vats in an attempt to mimic the real 5-Hour ENERGY products. The Shayotas and their co-conspirators engaged a plastics manufacturer in Mexico to copy the 5-Hour ENERGY bottles and caps, and recruited co-conspirators in the San Diego area to create counterfeit display boxes and plastic sleeves (bottle labels), which appeared identical to the true boxes and labels. The Shayotas and their co-conspirators also copied true lot numbers and expiration dates from genuine 5-Hour ENERGY and placed those numbers and dates on the counterfeit bottles that they had manufactured. From approximately December 2011 through October 2012, the Shayotas and their co-conspirators ordered more than seven million counterfeit label sleeves and hundreds of thousands of counterfeit display boxes, and placed false lot and expiration codes on the bottles and boxes. They often changed the lot and expiration codes on the counterfeit bottles and boxes to parallel the valid codes being used on the authentic product. Misbranded Food into Interstate Commerce, in violation of 18 U.S.C. § 371. Sentenced June 20, 2017, to 86 months in prison, 3 years of supervised release, a $144,868 fine, and forfeiture of $750,000. Misbranded Food into Interstate Commerce, in violation of 18 U.S.C. § 371 (Count Two). Sentenced June 20, 2017, to 26 months in prison, 3 years of supervised release, and a fine of $144,868. Misbranded Food into Interstate Commerce, in violation of 18 U.S.C. § 371 (Count Two). Sentenced on April 26, 2017, to 84 months on Count One and 60 months on Count Two, to be served concurrently; three years of supervised release; and $555,801.32 in restitution to Living Essentials. Misbranded Food into Interstate Commerce, in violation of 18 U.S.C. § 371. Sentenced on May 24, 2017, to 32 months’ imprisonment, 3 years supervised release, and restitution of $91,065.91 to Living Essentials. Misbranded Food into Interstate Commerce, in violation of 18 U.S.C. § 371. Sentenced on May 17, 2017, to 24 months’ imprisonment, and three years of supervised release, and $268,936 in restitution to Living Essentials. This sentence was ordered to run consecutive to a 6-month sentence imposed in a separate case in the Eastern District of Michigan under Docket No. 16-CR-20623-001-JCO. Misbranded Food into Interstate Commerce, in violation of 18 U.S.C. § 371. Sentenced on June 14, 2017, to three years of probation (to include eight months of home confinement) and a $20,000 fine. Misbranded Food into Interstate Commerce, in violation of 18 U.S.C. § 371. Sentenced on June 14, 2017, to six months’ imprisonment, six months’ home confinement, three years of supervised release, and $555,801.32 in restitution to Living Essentials. Misbranded Food into Interstate Commerce, in violation of 18 U.S.C. § 371. Sentenced on February 15, 2017, to five years of probation (to include six months home confinement) and a $30,000 fine. Agreed to pay restitution of $133,606.09 to Living Essentials. The government referred defendants Camilo Ramirez and Fadi Attiq to pre-trial diversion and Juan Romero remains a fugitive. The charges against Romero are merely allegations that crimes have been committed. As with all defendants, he must be presumed innocent until proven guilty beyond a reasonable doubt. Joseph and Adriana Shayota both were ordered to surrender on September 6, 2017, to begin serving their respective sentences. Assistant United States Attorneys Matt Parrella, Susan Knight, and Joseph Springsteen are prosecuting the case with the assistance of Lakisha Holliman and Elise Etter. Assistant United States Attorney David Countryman assisted with forfeiture matters. The prosecution is the result of an investigation by the Federal Bureau of Investigation and the Food and Drug Administration Office of Criminal Investigations.